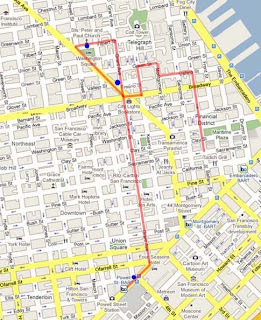 I work in the financial district and find it most convenient to walk after work in the evenings, ergo, most walks will start from the same point at Sacramento and Battery. Day 1: I figured two miles was a good starting distance. What I didn't figure was how steep the incline was on the streets near Coit Tower. Green Street is insanely steep. The first mile completely wiped me out. Also note my wardrobe was embarrassingly unfit for intense training. I wore my Clarks slip-on shoes and carried my stuff in a purse and tote that hung on one shoulder. BAD. That all said, the views on the walk were great and I totally enjoyed it. This mural is on the corner of Grant & Columbus. So cool. Go to http://billwebermuralist.com/ to see this dude's other works. The St. Peter & Paul Church by Washington Square. Awesome architecture. Not so awesome address: 666 Filbert Street. No lie. A cable car being towed by a truck seemed funnier in person...This marked the end of the my first walk, just in time to hop on the Powell Street BART for home.